The guaranteed content of chlorophyll in every capsule promotes the effectiveness of the product. The product is encapsulated in soft gel capsules, which are easy and convenient to use and store. The product has been manufactured using high quality pure raw materials and the technology that ensures all their beneficial properties intact, in strict compliance with GMP and TÜV regulations. The Greek word “chlorophyll” came from two words “chlorós” – green and “phyllon” – leaf. The ancient Greeks considered chlorophyll to be the most valuable natural product, extremely beneficial for human health. Chlorophyll is a green pigment used by plants to absorb sun light and realize the process of photosynthesis – the transfer of sun energy to chemical bond energy in organic substances. Chlorophyll was a symbol of life on Earth for centuries. Long before man learned to hunt and light the fire, he ate green plants that gave him energy for survival. Chlorophyll is called the green blood of the plants because its molecular structure is very similar to the structure of hemoglobin molecule – red blood cells of the human blood. The healing properties of chlorophyll have been known for ages. Chlorophyll was used for blood disorder’s treatments, as a breath freshener, to get rid of bad smells, to heal the infected wounds. Besides that, chlorophyll was used for digestive problems and to increase milk supply in lactating mothers. Nowadays the unique properties of chlorophyll are widely used to maintain health and wellbeing. Chlorophyll has a positive effect on all body’s systems, especially cardio-vascular, respiratory, digestive, and endocrine. The huge advantage of chlorophyll is that it is safe and has no side effects. Chlorophyll provides an overall restorative effect, increases host defenses. The similar structure of hemoglobin blood molecules (that supply oxygen to all body parts) and chlorophyll explains the chlorophyll’s positive effect on blood, its ability to increase oxygen levels. Chlorophyll demonstrates antioxidant activity, protects against free radicals. Chlorophyll soothes irritated mucus membranes. Chlorophyll improves bowel function, helps with toxin removal, and is a wonderful product for prophylaxis of kidney stone formation. Chlorophyll is effective for skin problems – clears up the skin. Chlorophyll has an amazing ability to remove unpleasant odors. In the 40ies and 50ies of the last century it was noticed that the local application of chlorophyll to the wounds with stinking odor had deodorizing effect. Since that time chlorophyll is being used as deodorant eliminating bad body and breath odors. The advantage of Chlorophyll Forte GP created by Santegra® is that it has a guaranteed content of chlorophyll in every capsule providing its effectiveness. Chlorophyll Forte GP is manufactured in soft gelatin capsules convenient for usage and storage of the product. These unique qualities make Chlorophyll Forte GP essential for those who care about their wellbeing, especially for people who are not spending enough time outside or do not get enough sun light. Sodium Copper Chlorophyllin - 50 mg.
Take 1 capsule with a large glass of water daily as a dietary supplement. In 1780, the famous English chemist Joseph Priestley found that plants could "restore air which has been injured by the burning of candles." He used a mint plant, and placed it into an upturned glass jar in a vessel of water for several days. He then found that "the air would neither extinguish a candle, nor was it all inconvenient to a mouse which I put into it". In other words, he discovered that plants produce oxygen. The actual chemical equation which takes place is the reaction between carbon dioxide and water, catalysed by sunlight, to produce glucose (С6Н12О6) and a waste product, oxygen. The glucose sugar is either directly used as an energy source by the plant for metabolism or growth, or is polymerised to form starch, so it can be stored until needed. The waste oxygen is excreted into the atmosphere, where it is made use of by plants and animals for respiration. The basic structure of a chlorophyll molecule is a porphyrin ring, co-ordinated to a central atom. 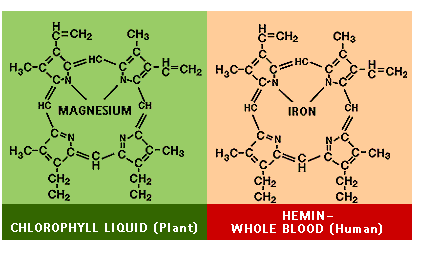 This is very similar in structure to the heme group found in hemoglobin, except that in heme the central atom is iron, whereas in chlorophyll it is magnesium. Santegra®’s product - Chlorophyll Forte GP contains chlorophyllin - a sodium/copper derivative of chlorophyll. In contrast to chlorophyll, сhlorophyllin is water-soluble and stable form of chlorophyll. Sodium copper chlorophyllin is produced by replacing the magnesium atom with copper and sodium. Introduction of the molecule of copper in chlorophyllin increases its biological activity. Copper has been chosen because of high biological activity of this metal including its anti-inflammatory. In one in vitro test, chlorophyllin demonstrated significant inhibition of several mutagens, including cigarette smoke, coal dust and diesel emission particles. Its antioxidant activity may have accounted for this effect. Residents of Qidong, People's Republic of China, are at high risk for development of hepatocellular carcinoma, in part from consumption of foods contaminated with aflatoxins. Chlorophyllin, a mixture of semisynthetic, water-soluble derivatives of chlorophyll has been shown to be an effective inhibitor of aflatoxin hepatocarcinogenesis in animal models by blocking carcinogen bioavailability. 1. Rudolph C. The therapeutic value of chlorophyll. Clin Med Surg 1930;37:119-21. 3. Gruskin B. Chlorophyll-its therapeutic place in acute and suppurative disease. Am J Surg 1940;49:49-56. 4. Hayatsu H, Negishi T, Arimoto S, et al. 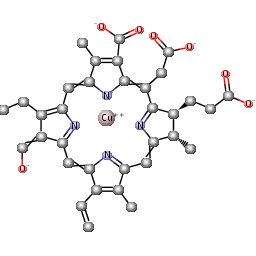 Porphyrins as potential inhibitors against exposure to carcinogens and mutagens. Mutat Res 1993;290:79-85. 5. Tachino N, Guo D, Dashwood WM, Yamane S, Larsen R, Dashwood R. Mechanisms of the in vitro antimutagenic action of chlorophyllin against benzo[a]pyrene: studies of enzyme inhibition, molecular complex formation and degradation of the ultimate carcinogen. Mutat Res. 1994;308(2):191-203. 6. Dashwood R, Yamane S, Larsen R. Study of the forces of stabilizing complexes between chlorophylls and heterocyclic amine mutagens. Environ Mol Mutagen. 1996;27(3):211-218. 7. Breinholt V, Schimerlik M, Dashwood R, Bailey G. Mechanisms of chlorophyllin anticarcinogenesis against aflatoxin B1: complex formation with the carcinogen. Chem Res Toxicol. 1995;8(4):506-514. 8. Egner PA, Munoz A, Kensler TW. Chemoprevention with chlorophyllin in individuals exposed to dietary aflatoxin. Mutat Res. 2003;523-524:209-216. 9. Kumar SS, Devasagayam TP, Bhushan B, Verma NC. Scavenging of reactive oxygen species by chlorophyllin: an ESR study. Free Radic Res. 2001;35(5):563-574. 10. Kamat JP, Boloor KK, Devasagayam TP. Chlorophyllin as an effective antioxidant against membrane damage in vitro and ex vivo. Biochim Biophys Acta. 2000;1487(2-3):113-127. 11. Park KK, Park JH, Jung YJ, Chung WY. Inhibitory effects of chlorophyllin, hemin and tetrakis(4-benzoic acid)porphyrin on oxidative DNA damage and mouse skin inflammation induced by 12-O-tetradecanoylphorbol-13-acetate as a possible anti-tumor promoting mechanism. Mutat Res. 2003;542(1-2):89-97. 12. Kumar SS, Shankar B, Sainis KB. Effect of chlorophyllin against oxidative stress in splenic lymphocytes in vitro and in vivo. Biochim Biophys Acta. 2004;1672(2):100-111. 13. Egner PA, Wang JB, Zhu YR, et al. Chlorophyllin intervention reduces aflatoxin-DNA adducts in individuals at high risk for liver cancer. Proc Natl Acad Sci U S A. 2001;98(25):14601-14606. 14. Chernomorsky SA, Segelman AB. Biological activities of chlorophyll derivatives. N J Med. 1988;85(8):669-673. 15. Young RW, Beregi JS, Jr. Use of chlorophyllin in the care of geriatric patients. J Am Geriatr Soc. 1980;28(1):46-47. 16. Yamazaki H, Fujieda M, Togashi M, et al. Effects of the dietary supplements, activated charcoal and copper chlorophyllin, on urinary excretion of trimethylamine in Japanese trimethylaminuria patients. Life Sci. 2004;74(22):2739-2747. 17. Kephart JC. Chlorophyll derivatives - their chemistry, commercial preparation and uses. Econ Bot. 1955;9:3-38. 18. Bowers WF. Chlorophyll in wound healing and suppurative disease. Am J Surg. 1947;73:37-50.